In the coming decade, the economic environment in India is likely to be highly conducive to the growth of the aluminium extrusions sector. The downturn in the building & construction sector over the last few years had its negative impact on the demand for aluminium extrusions, as well. However, this sector is likely to witness double digit growth in the coming decade thanks to favourable factors such as the reviving fortunes of the building & construction sector, Government’s focus on building “smart cities”, massive thrust on solar energy, new applications in the transportation sector and so on. 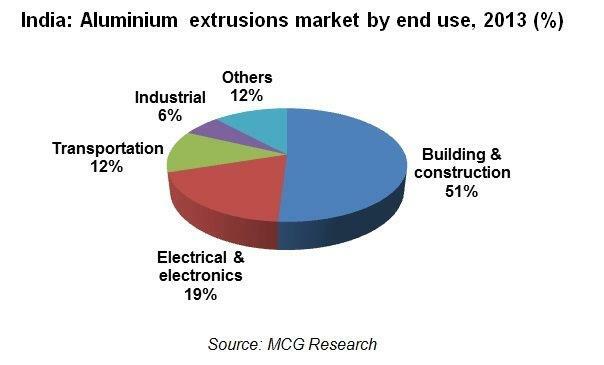 The aluminium extrusions sector in India has an installed capacity of around 550,000 tonnes per annum spread across an estimated 150 units that have presses ranging from 360 T to 9000 T capacity. The usage of aluminium extrusions in India, in 2013, was about 380,000 tonnes. While the building & construction segment accounts for 51% of the demand, industrial applications are growing rapidly. Architectural applications such as doors, windows, curtain walls and glazing account for about 51% of the total extrusions usage in the building & construction sector. New applications such as formwork and scaffolding are driving the demand in this segment and conventional materials such as wood and steel are giving way to aluminium and uPVC. The trend towards hi-rise and modern buildings with better aesthetics will continue to drive the demand for high quality extrusions. The electrical energy sector in India has witnessed rapid progress over the recent decades with significant increase in power generation capacity as well as expansion of transmission and distribution lines. With sustained growth in this sector, the demand for extruded aluminium components such as bus bars and other accessories are expected to grow. With strong support from the Government, the solar energy sector is likely to grow by leaps and bounds with corresponding expansion in the demand for aluminium extrusions for frames and anchors. The emerging LED lighting market in the country will drive the demand for heat sinks, along with several other applications in the electrical and electronics sector. With an increasing emphasis on light weighting, the usage of aluminium extrusions for applications in the transportation sector is expected to expand rapidly. In the automobile segment, India has a long way to go to reach the average of 150 kg per vehicle already achieved in the USA. India was one of the pioneers in developing and building aluminium bus body structures but has fallen behind in recent decades. The state governments and the private operators are now paying increasing attention to the quality of the bus ride, fuel efficiency and emission norms and these trends translate to better prospects for usage of aluminium extrusions in buses. From a skill and cost perspective, India is well poised to take advantage of the export market opportunities in the transportation sector, especially in Europe and North America. However, there are certain issues which the aluminium industry in India needs to address such as availability and quality of billets, especially for hard alloys. There is a perception in some quarters that the quality of billets that are imported from Dubai, Qatar or from Europe is significantly higher than what is available locally. The development of extrusion business depends on the ability of an extruder to source the high quality billets in multiple alloys and the ability to get manufacturing waste recycled locally. From the environmental perspective, it is important to have recycling plants that produce high quality billets from both manufacture waste and end of life scrap. Many Indian extrusion manufactures do not have their own finishing lines for powder coating or anodising and depend on external resources for this value addition. Consequently, for high end buildings the import of profiles from GCC extruders is not uncommon. Yet another issue facing the Indian aluminium extrusion sector is the lack of scale with far too many small players scattered across the country and there are just a handful of large players who can invest in the latest technology. Hence, it is time for the stakeholders of the aluminium extrusion sector in India, viz. the extruders, primary aluminium producers, recyclers and the end users to converge and put this sector firmly on the high growth trajectory. What is the container size of the 9000T press and where is it located? What kind of order do they process? What is the average booking per month? The press is located near Nagpur in GOI’s ordinance factory. This factory caters mainly to the requirement of the Defence department in India.